The City Heights Partnership for Children rallies organizational partners, community members and parents to break down barriers for kids. Bags were filled to the brim with educational goodies — crayons, pencils, flash cards, books, scissors and magnetic letters. More than 30 parent volunteers were ready to distribute these “Ready for K” toolkits and teach fellow parents about preparing their children for kindergarten. The initiative started in 2013 in San Diego’s City Heights neighborhood as part of United Way of San Diego County’s (UWSD) local cradle-to-career partnership, the City Heights Partnership for Children (CHPfC). 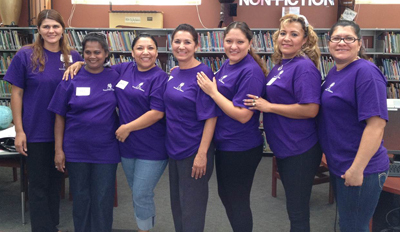 Parent volunteers, or promotoras, hosted “Ready for K” workshops during kindergarten registration and the early spring. Already, they have helped 1,200 families in the community understand the importance of kindergarten readiness and parent engagement, as well as given them the tools that they need to make it happen. In a neighborhood with a high percentage of immigrants and refugees and 10 elementary schools, roughly half of incoming kindergartners speak a language other than English at home. At Central Elementary School, nearly 75 percent of students identify Spanish as their first language. This makes the promotoras, who are often bilingual volunteers, even more important, Central Elementary School Principal Elizabeth Castillo-Duvall said. In 2013, fewer than half of the neighborhood’s third-graders scored proficiently on the state’s reading test; proficiency rates were even lower in elementary schools with higher populations of English language learners. Looking at the data, Partnership for Children found that incoming kindergartners often lacked basic literacy skills needed for kindergarten readiness and early grade reading. In response, the partnership convened its early literacy partners to create the “Ready for K” toolkits and workbooks, written in English, Spanish, Somali and Vietnamese. The toolkits were created by the partners, including Community Housing Works, Words Alive, the San Diego Library and the San Diego Council on Literacy, and funded by The Parker Foundation and UWSD. CHPfC started when several curious San Diegans attended a Collective Impact Conference at Stanford University where StriveTogether Managing Director Jeff Edmondson spoke about the StriveTogether Cradle to Career Network. Edmondson followed up with those colleagues to talk about starting a collective impact partnership. Through support from Price Philanthropies, The California Endowment and United Way, the group pulled together funding and fulfilled the backbone function. From there, starting the partnership was not an easy task, according to partnership administrator Torrey Albertazzi. It involved long hours in school cafeterias, parent centers and libraries to build trust with skeptical parents who had seen many initiatives come and go. There were also one-on-one meetings with school principals, community-based organizations and local foundations in an effort to align the often siloed work throughout the neighborhood. Finally, in October 2011, more than 50 parents, community leaders, partners and funders attended a San Diego Unified School District Board meeting. After listening to testimonies of Partnership for Children’s vision “for every child, every step of the way,” the school board voted unanimously to join the partnership and its approach to improve cradle-to-career outcomes. Today, the partnership has five full-time staff and brings together cross-sector representatives from around the City Heights neighborhood. The leadership table is co-chaired by the superintendent of San Diego Schools and the local program manager of The California Endowment, and has a diverse membership including the police department, San Diego State University, the teacher’s union, the Workforce Partnership, parents and nonprofit organizations. Partnership for Children also convenes collaborative action networks focused on early language acquisition, preschool, early literacy, third-grade reading proficiency and an Early Warning Continuum that helps keep kids on the right track. But perhaps most importantly, Partnership for Children focuses on engaging the community to ensure everyone is on the same page. After prioritizing data points and action plans at the leadership table, the partnership talks with community members to make sure everyone is ready to work and move in the same direction. Having StriveTogether as a strategic partner has been beneficial for Partnership for Children’s data work, Anzellotti said. Now, the partnership uses data to find and develop targeted interventions for students. Ten interns are placed in four pilot schools, working directly with principals, staff, struggling students and their families to figure out what is needed to get kids back on track. Some may need academic support, while other families may need assistance outside of school. The program launched in October and the partnership has been diligently using continuous improvement to make adjustments and modify the work to ensure better outcomes. The City Heights Partnership for Children brings together leaders from the education, health and human services, nonprofit, business, civic and philanthropic sectors to improve outcomes for young people in the urban core of San Diego. Partnership for Children is focused on generating results through collaborative action, the effective use of data and the alignment of resources that work for children and students. Partnership for Children is an Emerging member of the StriveTogether Cradle to Career Network.